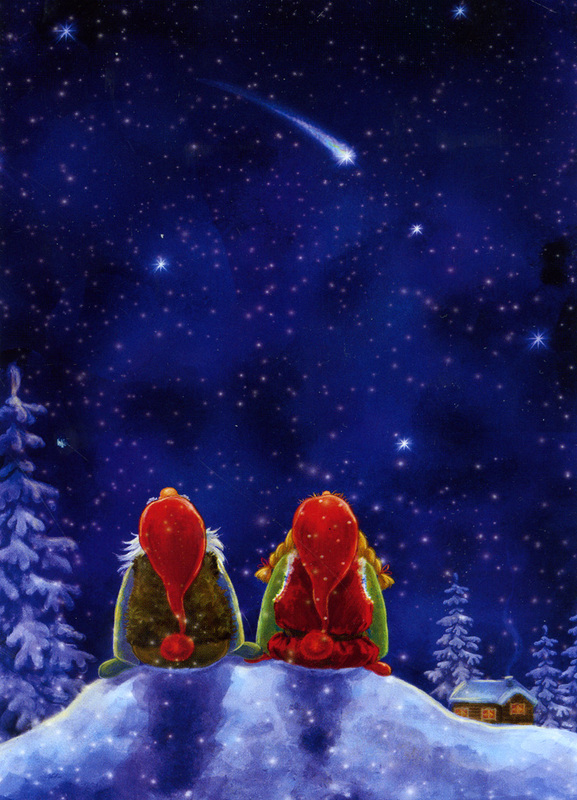 To all my friends out there in the multiverse. May your dreams come true and the Force be with you in 2019. 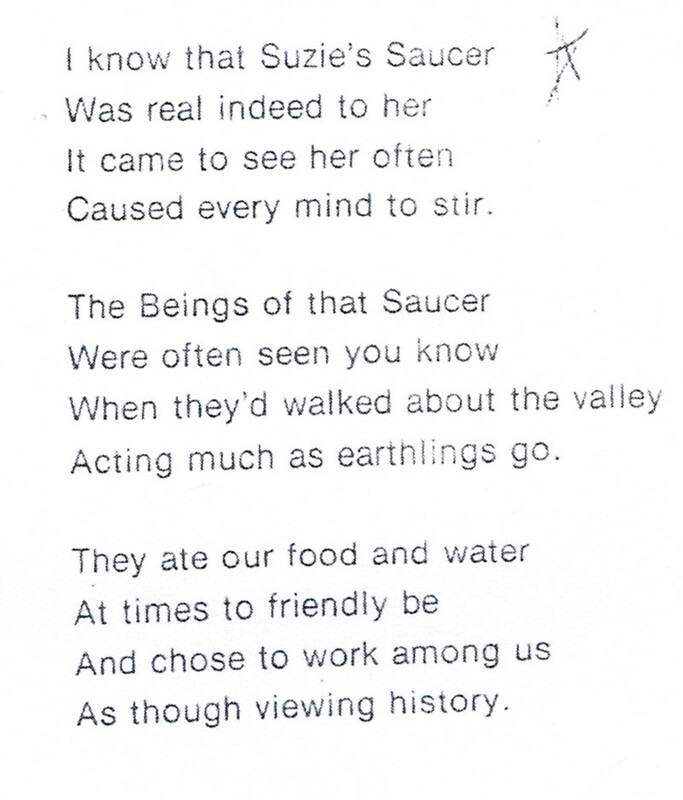 For several years I have been trying to obtain an rather unusual contactee book, Suzies Sudden Saucer, written by Dorris Van Tassel (Dorris Andre). Although it was obviously published in two editions, 1976 and 2000 (revised), I have never seen it in print, nor found one for sale on Amazon, eBay etc. At AFU we have only one, not very good, copied version. 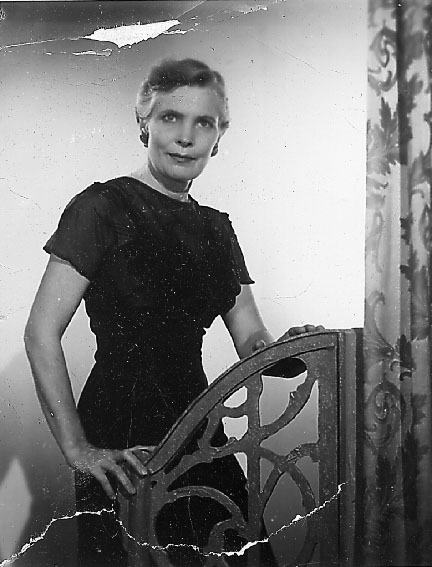 Dorris Van Tassel (1912-1991) was an enigmatic woman and, what John Keel would call, a silent contactee. 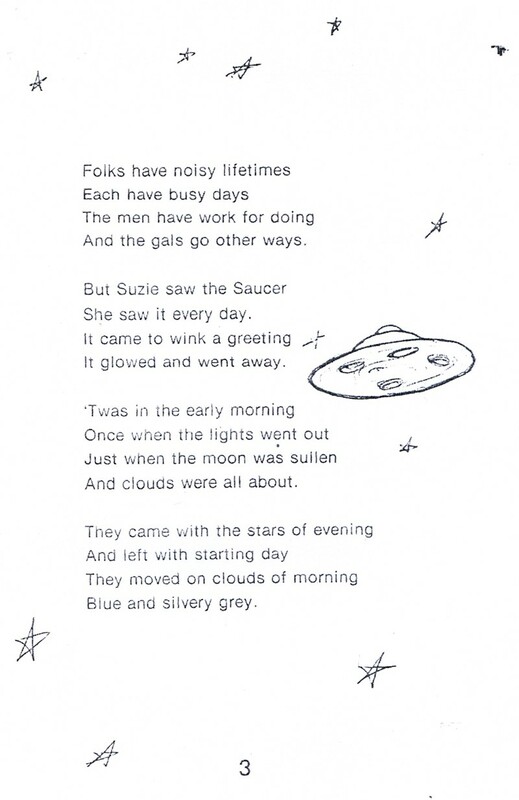 Suzies Sudden Saucer is often portrayed as a children´s book, a poetical story of contact with space people. But I suspect this 37-page book is actually an autobiography. 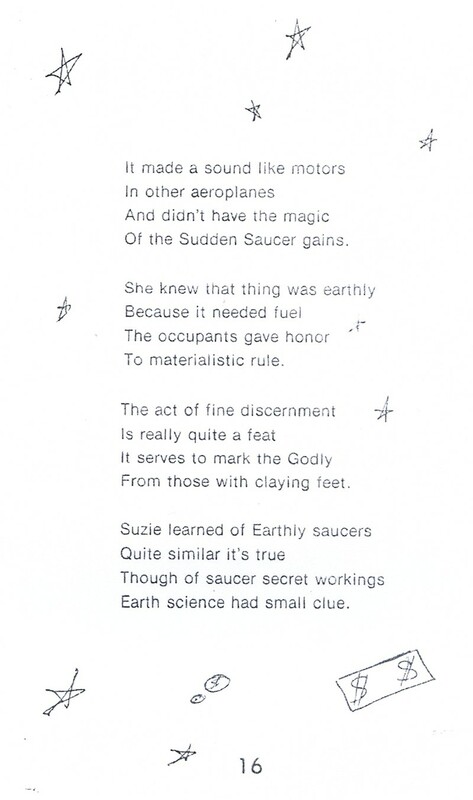 The first edition of Suzies Sudden Saucer was advertised in Proceedings, Oct-Dec 1976, as ”a small book on the philosophical approach to life”. Authors were stated as Dorris Van Tassel and Bob Benson (illustrator). 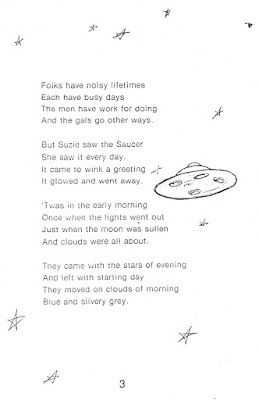 In 2000 a revised edition was published with the subtitle Suzies Silver Saucer. Foreword was written by Brianna M. Wettlaufer and Heidi Menger Evans. Heidi had also contributed illustrations and photographs. She is the daughter of Howard and Conny Menger. This new edition, published by the Ministry of Universal Wisdom, has 75 pages, possibly because of large type. In a former blog post I have presented a summary of data on Dorris Van Tassel, a woman of mystery and very much involved in behind the scenes activity among UFO contactees in the 1950s. She was a sort of booking agent for George Adamski, Truman Bethurum, Daniel Fry and other contactees. 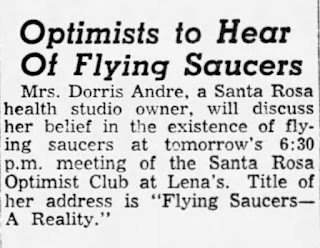 As Mrs. Dorris Andre she lectured on flying saucers but did not mention her own contacts with space people until 1976, during a lecture at Daniel Fry´s Understanding Convention. A short note of her lecture was published in Understanding magazine: ”Two women were a delightful part of the program. Dorris Van Tassel told the story of her contacts with space people, a fantastic story it was too. Until you have heard her, you´ve missed something.” (Understanding, vol. 21, no. 5, 1976, p. 6). 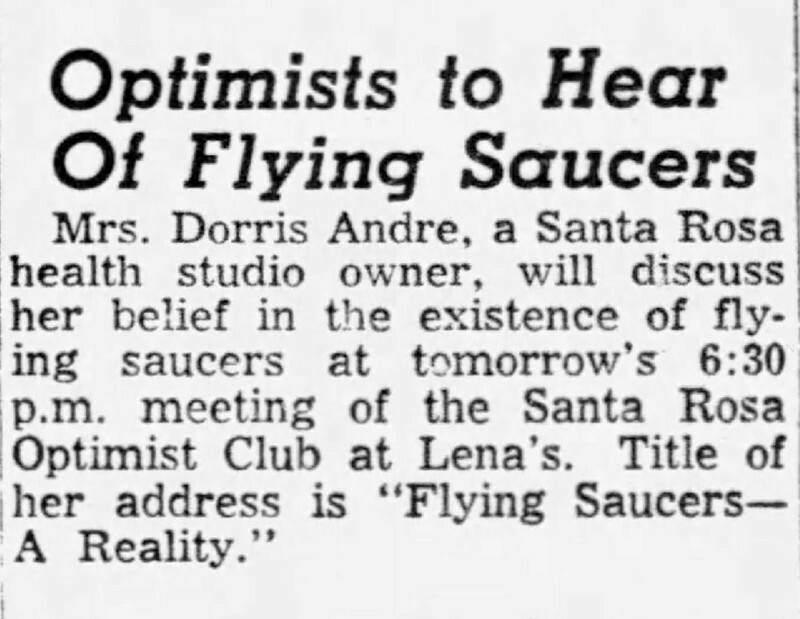 Already in the beginning of Suzies Sudden Saucer there are hints that this story is actually the secret life history of Dorris expressed in allusion and poetry. Many of the verses mention early childhood contact experiences reminiscent of the life of Howard Menger. 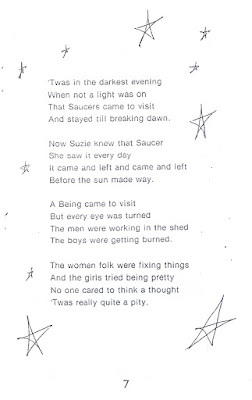 In several verses we are told that Suzie (Dorris) very early in life understood that she was different than other men and women because of her experiences and contacts, both physical and telepathic with the space people. 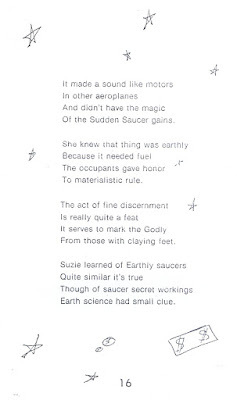 On page 15 and 16 are some interesting verses where Suzie is frightened by ”earthly” saucers that don´t belong to the benevolent space people but instead belong to occupants who give honor ”to materialistic rule”. A connection between the work of the benevolent space people and the Esoteric Tradition or Ancient Wisdom is narrated on page 21. Here Dorris also alludes to her special mission on this planet. 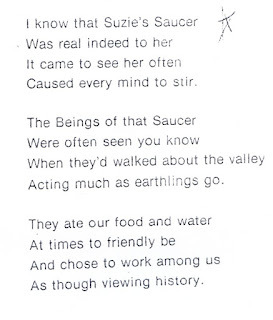 In Suzies Sudden Saucer the author mention both physical and telepathic contacts and the secret work with the space people going on behind the scenes. Dorris implies that she cannot tell the whole story ”knowing more than most”. There are still many unanswered questions and enigmas regarding Dorris Van Tassel and her contact experiences. 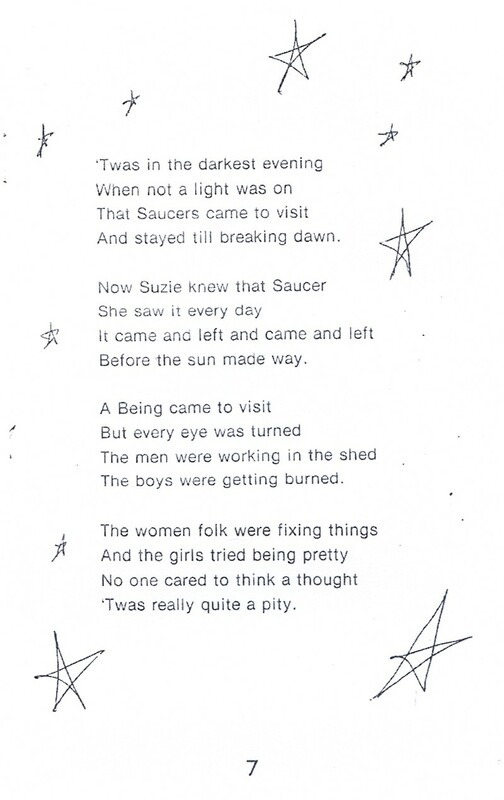 Perhaps some of the clues to her secret life can be found in Suzies Sudden Saucer? 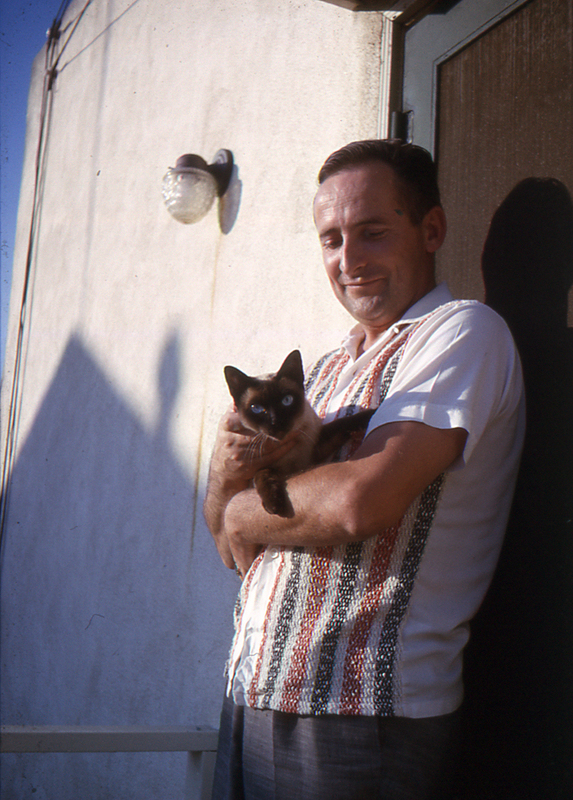 In reviewing and organizing documents from the BSRF archive at AFU I have now completed the file on Trevor James Constable (1925-2016), for many years associated with Borderland Sciences Research Foundation. I have scanned articles, interviews, booklets, photos and assorted documents including the correspondence file consisting of 206 letters, written between 1959-1997. By studying these letters and rereading the books and articles written by Trevor James Constable I have tried to solve some of the riddles regarding his UFO contact experiences in 1956-1957. A internet search for Trevor James Constable resulted in 9,040 links, mostly references to his two books, They Live in the Sky (1958), The Cosmic Pulse of Life (1976), etheric weather engineering and infrared photography of ”sky critters”, invisible amoeba-like elementals often confused with UFOs. What many readers of these sites may not be aware of is that all this activity was originally inspired by and the result of Constable´s contact with space people. 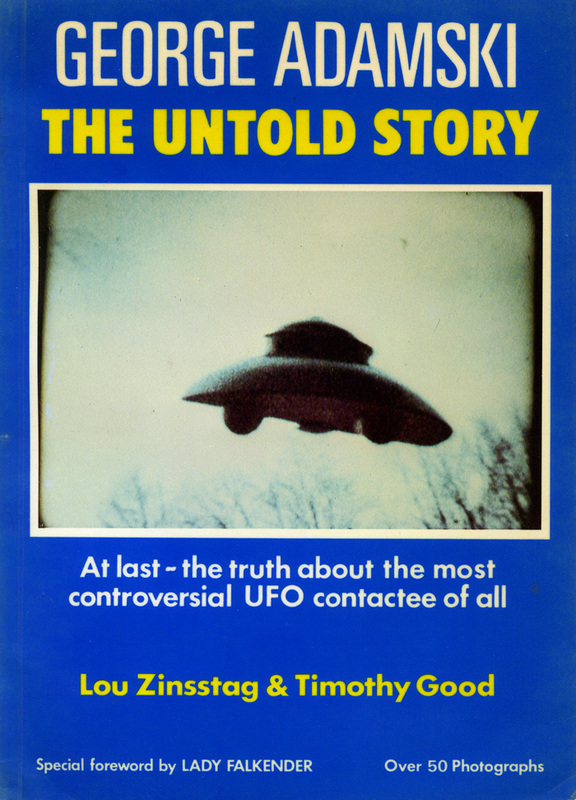 Few investigators have made an in-depth study of these decisive UFO experiences. 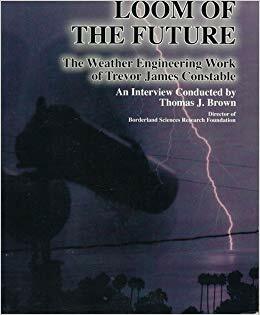 Neither is there much information on his contacts in Thomas Brown´s extensive interview Loom of the Future, the Weather Engineering Work of Trevor James Constable (1994). Thomas Brown was director of Borderland Sciences Research Foundation 1985-1995. Trevor James Constable was born 1925 in Wellington, New Zealand. As a lincenced Radio Electronics Officer he served in the Merchant Marine of New Zealand, Great Britain and for 26 years in the U.S. Merchant Marine. After emigrating to the United States in 1952 Constable became interested in the UFO enigma and read the classic books of Keyhoe, Wilkins, Jessup, Adamski and others. Fascinated by the prospect of contact with UFO intelligences he visited George Van Tassel who gave Constable instructions on how to contact space people and also warned of possible ill effects. Being an adventurous and practical man he did not heed this cautioning and spent several months in trying to open up communication with space people. I have not been able to determine what year Constable met Van Tassel. Possibly 1955, as the first result of the telepathic contact experiments were published (under the pen name Trevor James) in two small booklets, Spacemen – Friends and Foes, 1956. 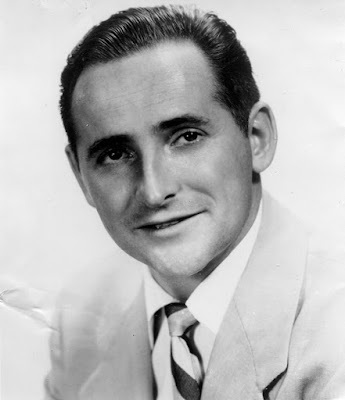 Publisher was Franklin Thomas, who together with his wife Dorothy, operated the New Age Publishing Company in Los Angeles between 1948 and 1959. 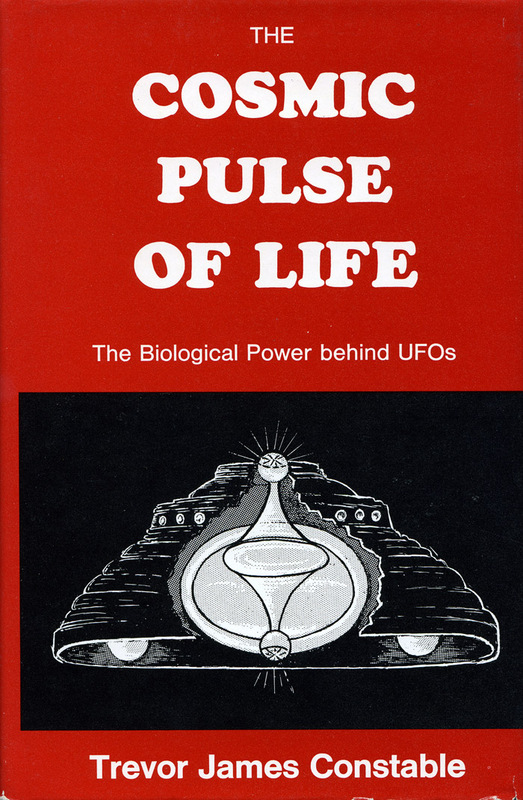 They issued many of the classic 1950s contactee books. The couple also ran a small bookshop on Glendale Boulevard, where Thomas used to lecture on Friday evenings on various occult and new age topics. Thomas was an experienced esotericist who taught Constable how to control his psychic faculties: ”I had learned, through Franklin Thomas, how to sort out the otherworld telepaths. Those intelligences which would seek to communicate without controlling had what seemed to be valid information.” (The Cosmic Pulse of Life, p. 50). It was also Franklin Thomas who inspired Constable to study the teachings of Rudolf Steiner. Anthroposophy from now on became the guiding light and worldview that he always would relate too and promote for the rest of his life. In 1956-1957 Constable, together with his friend and co-worker James Woods, made many trips to various places in the Mojave desert in California, combining channeling sessions with infrared photography. The idea to initiate such a photo project was originally presented by a well known spaceman in contactee circles, Ashtar: ” ”The first and most essential ”wrinkle” we learned was the use of infrared film, which permits photography of invisible light or radiation. We obtained this information from Ashtar, whose early suggestion it was, before I terminated contact with him many months ago.” (The Live in the Sky, p. 218). The last sentence is certainly intriguing. Why would Constable ”terminate” his contact with Ashtar and other space people when he regarded these messages as valid and emanating from benevolent alien visitors? In all the documents I have studied there is no explanation for this decision. 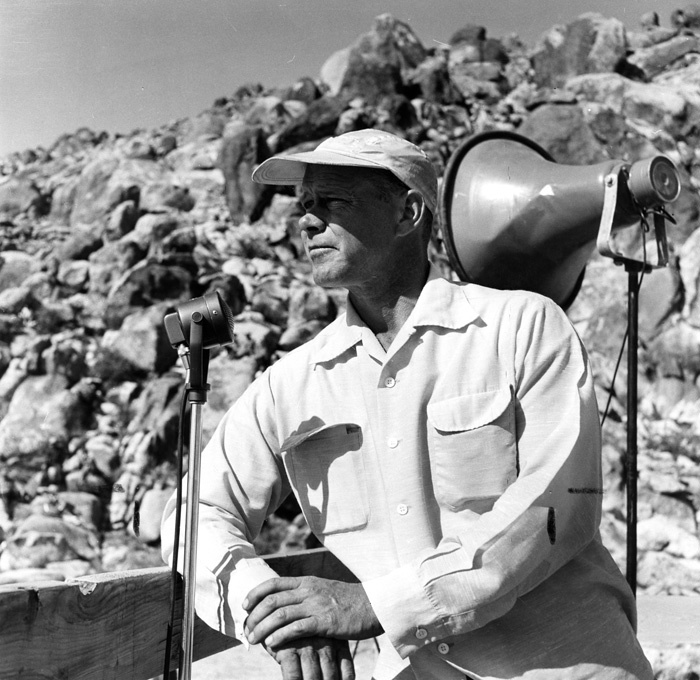 The first individual to claim contact with Ashtar and other space people, with rather odd-sounding names, was George Van Tassel in 1952. According to Van Tassel these messages were not received with ordinary telepathy or channeling but relayed via an instrument referred to as adiphone. 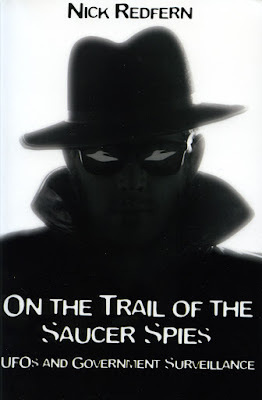 The information delivered to Van Tassel is of a very mixed quality as anyone reading his book I Rode a Flying Saucer can ascertain. But he also had physical contacts with space people and in my view was part of a psychological-sociological test made by a group of benevolent alien visitors in the 1950s. According to journalist and esotericist Paul M. Vest the space people used physical contacts, ham radio, clairvoyance and clairaudience in this operation. ”Question: ”From your statement that you are etheric, am I to presume that you have evolved beyond the stage of a physical and astral body”? Ashtar: ”Correct. I do not possess a physical casing of the dense type such as yours. I am definitely etheric, as are all people on other planets in this solar system.” (p. 39-40). Question: When you speak of making etheric matter visible at will, is this the way that George Adamski was permitted to take his now famous photographs? Ashtar: ”Yes, Ether ships as they have been called on your surface, have been made visible to and for certain individuals, selected, upon your surface of whom Adamski is one. Normally the ships are part of the invisible world.” (p.46-47). Question: Why has the information you have given me been passed through me? That is, why have I been used as the channel for it? Ashtar: ”This information is well known in occult circles upon your planet, and has been known for many thousands of years by those you term initiates and adepts.” (p. 170). Ashtar warned Constable that there were scores of impersonators and deceivers in the invisible worlds who used his name: ”He has frequently stated that many come in his name and under his name, and therefore that it is foolish to presume that because a message comes ”from Ashtar” it is automatically the truth.” (p. 161). This proved very true as after Van Tassel and Constable a large channeling industry appeared using Ashtar or Ashtar Command. George Adamski, critical of channeled communications, noted this phenomenon during his European tour: ”In Europe I encountered reports of two Ashtars, totally different in character, but each claiming supreme command over large numbers of space travelers. From such dubious sources have come promises of personal contacts, sometimes even with specific dates and instructions as to time and place.” (George Adamski, Flying Saucers Farewell, p. 113-114). Although Constable all his life defended George Van Tassel as a genuine contactee he also voiced some critical views in The Live in the Sky. 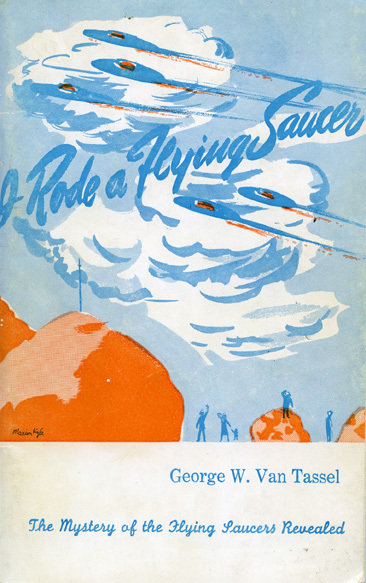 Constable agreed with Riley Crabb that Van Tassel was not enough discerning when inving speakers to his annual Spacecraft Conventions at Giant Rock: ”The major fault of George´s Conventions is that no effort is ever made to set aside, however briefly, the monotonous reiteration of these astral experiences with spacecraft, undergone by well-meaning but hopelessly disoriented sensitives… The book (The Live in the Sky) had just come of the press prior to the Convention, and I previously wrote to George and told him that I would appreciate the opportunity to speak to the people about these new discoveries. When Convention time came, George took care that I did not get on the platform. Some reference to him in the book, which were truthful and honest expressions of my own views disagreeing with his, apparently aroused his ire.” (Trevor James Constable, Think About This, Psychic Observer, May 10, 1959, p. 4). This prophecy would prove devastatingly true. The manuscript to The Cosmic Pulse of Life was rejected by Harper and Row in 1974. On August 16, 1975 Constable married his second wife Linda Christine. What then happened was told to Riley Crabb in a letter October 16, 1975: ” On 2 October she jumped 22 stories in Honolulu to her death, while I was en route from New Guinea to San Francisco.” This was a personal tragedy and terrible blow from what Constable believed was a murder orchestrated by the ”Ahrimanic powers: ”Well, slowly I recover from the occult murder of my beloved spouse. Believe me, that was one hell of a cannon ball – and having to survive it out on a ship thousands of miles from home and all my control cords just about put me out of the body myself. That was the idea of course…Frank Thomas went through the same thing when ”They Live in the Sky” was published, but he got the job done before losing his body two months afterwards.” (Letter from Trevor James Constable to Riley Crabb, Feb. 26, 1976). 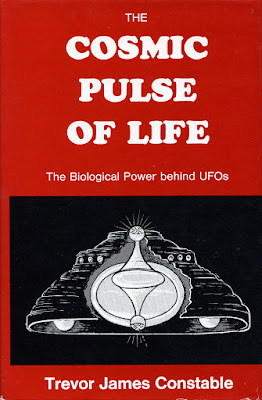 The Cosmic Pulse of Life was finally published in 1976, ”Dedicated to the memory of my beloved wife Linda Christine 1944-1975 – My Eternal Star”. Later Constable found a new love in his third wife Gloria. 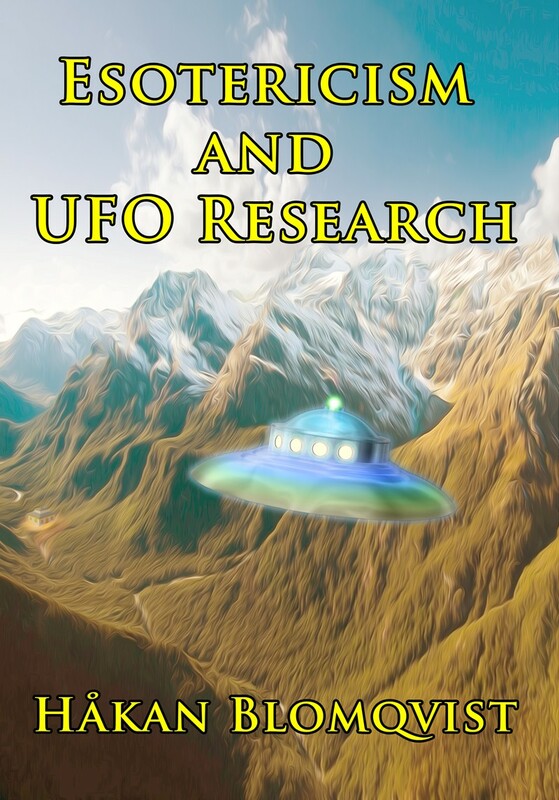 They Live in the Sky and The Cosmic Pulse of Life have become classics in UFO literature. Because of Constable´s theory of the critters or bioforms some author´s have misunderstood his writings, claiming all UFOs are invisible critters. Now and then Constable had to officially defend his actual position on the UFO problem. 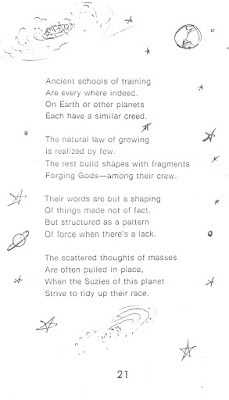 Here in a letter to author Andrew Collins: ”Where in any of my works is the statement you impute to me, that ”UFOs are not spacecraft at all, but bioforms… etc. etc.”? You will find in Cosmic Pulse of Life that the point is comprehensively deliniated that there are TWO distinct types of UFO´s which are MUTUALLY CONFUSED. These are the ether ships, and the bioforms. The confusion is intensified by the etheric power source of both kinds of UFO´s. This is the first qualitative element introduced into the UFO subject. You refer to this not at all – just critters.” (Letter from Trevor James Constable to Andrew Collins, Aug. 15, 1992). 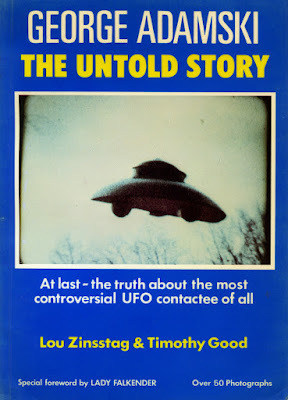 There are still many unanswered questions regarding the UFO contacts of Trevor James Constable. In spite of my study of his extensive correspondence and articles I have not found out why he terminated his, obviously positive and inspiring, contact with the space people? Neither have I been able to find out whether his personal archive has been saved. 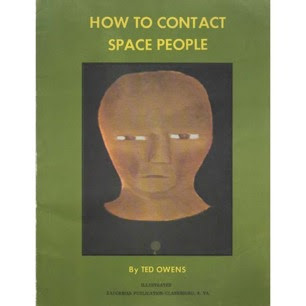 I assume there must be more messages received from his space friends than so far published. Trevor James Constable was a brave pioneer in the UFO movement and I hope the ultimate biography of his life and research will one day be written. How much does the military intelligence agencies of the world´s superpowers actually know of what is going on regarding UFO contacts and abductions? I don´t mean the general intelligence agents but the special black ops operatives with a need to know who are trying to understand and handle the situation. Are these operatives also involved in what has been called MILABS, military abductions of close encounter witnesses and abductees? Is it even possible for investigators of this secret underground world to discover what is going on and who is doing what to whom? 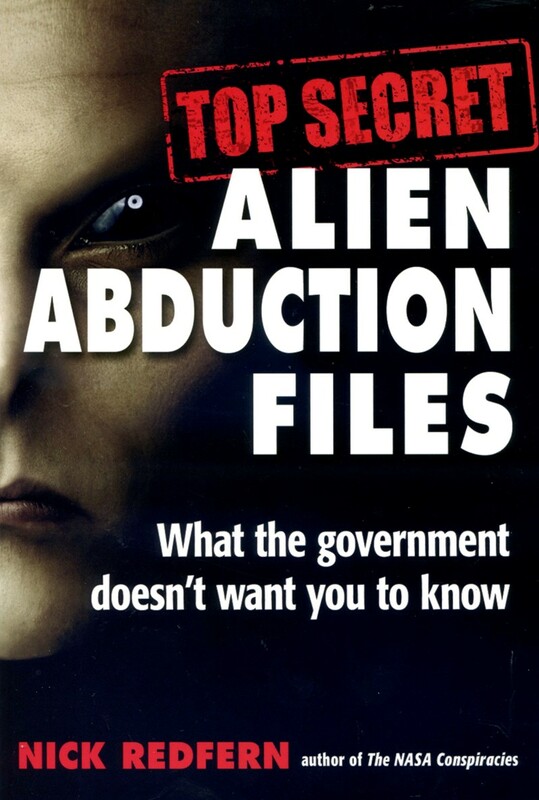 This controversial issue is addressed by Nick Redfern in his latest book Top Secret Alien Abduction Files. In his introduction Redfern relates what many investigators have come to believe regarding abductions: ”According to numerous accounts, after being kidnapped by alien entities, the abductees are shortly thereafter kidnapped again … by the government. These follow-up MILABS are the work of a powerful group hidden deep within the military and the inteligence community.” MILABS is short for Military Abductions. An important document in this genre is The Controllers by Martin Cannon. 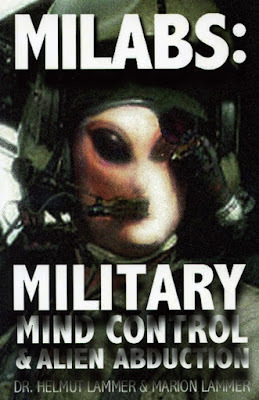 This theory was also studied and documented by Dr. Helmut Lammer and Marion Lammer in their book MILABS: Military Mind Control and Alien Abduction (1999). Based on several years of research Lammer concluded that some abduction cases could actually be secret experiments by various military intelligence agencies. In April 2011 I wrote to Dr. Lammer asking for more data on his research. He very kindly told me he had abandoned all research on abductions and mind control and had no further interest in the subject. I then asked if he would consider donating his research material and archive to AFU. I was quite surprised when told that his entire archive had been thrown away. Why would a scientist destroy the result of many years of research? Was the subject too sensitive? Because of documents obtained thanks to the Freedom of Information Acts in United States and the United Kingdom we know that military and intelligence agencies creates secret files on contactees and other individuals involved in the UFO movement. From the 1950s there are FBI files on George Adamski, Orfeo Angelucci, George Van Tassel and others. Much of this activity was motivated by political reasons and the Cold War fear of Communism. In the first chapter Redfern presents some of these documents and contact stories. But he should have checked basic facts about the contactees better. The alien visitor Adamski met on November 20, 1952 did not present himself as Orthon. This was a fictitious name later adapted by Adamski and his co-workers. George Van Tassel did not ”drive out to a nearby area” for his encounter with landed craft and crew. He was sleeping outside at his property at Giant Rock when awakened in the middle of the night by the presence of an alien visitor. And Van Tassel did not die in 1977, but on February 9, 1978. These are minor faults of course but still facts that could easily have been found in UFO literature or on Internet. Karl Hunrath was an enigmatic figure in 1950s contactee circles. Most well known because, together with his companion Wilbur Wilkinson, he disappeared during a flight, taking off from a small airstrip outside Los Angeles, November 10, 1953. Redfern makes a summary of the case based on FBI files and UFO history. These documents reveal Hunrath as a troublesome and not very savory character who claimed to have been visited in his bedroom by a tall, thin man dressed in a dark suit. The unknown intruder injected him with some form of chemicals and said: ”I am Bosco. You have been chosen to enter our brotherhood of galaxies.” Later Hunrath told of having a secret technology that could bring down both our own aircraft and saucers. By a strange co-incidence the name Bosco appears in connection with the classic Antonio Vilas-Boas abduction in Brazil 1957. Ufologist Rick Reynolds was in 1978 approached by a mysterious man named Bosco Nedelcovic, who claimed to have worked for the CIA and the Department of Defense. One of his projects involved destabilizing prominent figures in the civil rights movement. 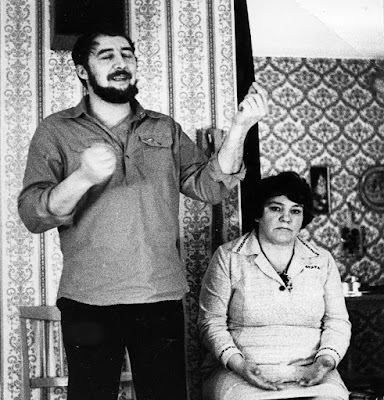 Nedelcovic also revealed that he had been involved in the Vilas-Boas abduction which was a part of the CIA´s mind control program called MK-Ultra. With the help of a helicopter and a chemical derivative in gas form the MK-Ultra operatives wanted to find out how the human mind could be altered and manipulated by hallucinogenic substances. And Antonio Vilas-Boas became the unfortunate human guinea pig. After this first documented MILABs operation Redfern asks the obvious question – who are the real abductors? This question becomes even more relevant when comparing the Nedelcovic story with the abduction experiences of Alison, a woman living on a ranch not far from Sedona, Arizona. The case was documented by Nick Redfern in his 2006 book On the Trail of the Saucer Spies, pp. 115-117: Alison´s abductions always start with a humming sound, loss of electricity in the house and her dogs becoming very distressed. Bright lights envelope the room and in a semiconscious state she is aware of small creatures carrying her to a small craft outside the house where she is examined and then led back to the house. On her fifth abduction something extraordinary happens. The humming sound stops abruptly and Alison slowly regain her normal senses. The small gray aliens fade away and instead she find a group of large and burly men in black fatigues in her room. According to Alison one of the men screamed "what happened" in a microphone. Another man utters the word "sorry" in her direction and the men leave in, not an alien spacecraft, but an unmarked black helicopter. Alison is convinced she has been used in covert military experiments with advanced forms of psychotronic technology, drugs and hypnosis. Much of Nick Redfern´s new book is a chronology and summary of well known abduction cases such as Gerry Irwin, Barney and Betty Hill, Betty Andreasson, Whitley Strieber, Judy Doraty, Myrna Hansen and Christa Tilton, leading up to stories of black, unmarked helicopters, cattle mutilations and secret underground military bases. One of the most intriguing cases of recent MILAB activities is the story of Charlie, a man from Shreveport, Louisiana who contacted Redfern in late 2016. Charlie´s encounter happened on January 2, 2015 when he was nineteen years of age and living in a small house in an isolated area. At about two in the morning Charlie was watching TV when a compulsion made him go to the living room window. He notice a police car parked outside the house. He decides to go outside and ask the police if everything is ok. As Charlie approach the car he get the strange feeling of being ”half-awake”. But what really frighten him is the look on the face of the police officers: ”an insane smile; like crazy and dangerous”. Suddenly the car and the two officers vanish and in their place is an egg-shaped object. Charlie try to run back to his house. The next thing he remember is standing in a field behind the family´s home together with two classic Men in Black. The men haul him aboard a craft nearby where he is strapped on a thin bed. Three small figures walk into the room, large hairless heads and huge black eyes. Charli can feel how something cold and metallic in put in his nostril and he starts to get images in his mind, apocalyptic visions of war and devastation. Suddenly Charlie finds himself standing in the family yard again, watching the police car leaving in the darkness of the early morning. About a month later Charlie has a dizzy spell and fall asleep on the couch. When waking up he notice a man in black, military-style outfit and two other men in the room. Another man comes from the kitchen injecting something into Charlie´s arm and he suddenly finds himself in the back of a large van with the four men around him. They start interrogating Charlie, stating they know everything about his encounter a month ago and they want him to share every aspect of the incident. After sharing the story one of the men explain to Charlie that ”we have in our midst a dangerous race of extraterrestrials who are routinely implanting devices into large numbers of the American population – devices that have the ability to control and manipulate people as they see fit.” After this explanation Charlie is driven back to his home and given an apology for the rough handling. In May of this year I received an email from an American woman, Laura (not the real name), who had found my blog and wanted to share a very frightening close encounter she had experienced together with her husband John (not the real name). Of interest is that her husband is a retired military, special ops, military intelligence. The close encounter was the beginning of a two year long odyssey of strange experiences, among others the observation of a sort of surveillance device outside their house. What then happened on the night of January 11, 2011 was documented in great detail in a nine page letter received by me on September 21, 2018. Reports of encounters with these type of insectoids, looking like praying mantices have increased during the last decades. They remind me of the American contactee Ted Owens who told that the space intelligences he communicated with looked like grasshoppers on two legs. Because of the shape shifting demonstrated by these entities it is difficult to evaluate what we are dealing with. Evil aliens, holographic projections or what? Whatever they don´t belong to ”the good guys”. There is not much help here in information from the core esoteric works of Blavatsky, Bailey or Laurency who very seldom mention evil extraterrestrials. But there is one interesting comment made by the Tibetan to Alice Bailey, warning of a form of ”cosmic evil” reaching manking: ”… an evil which is not indigenous to our planet, an evil with which it was never intended that men should deal.” (Alice Bailey, The Rays and the Initiations, p. 753). During his last years, living in New Zeeland, esotericist Riley Crabb wrote a few booklets trying to present this problem based on various esoteric sources. In the last chapter, Conclusions, Nick Refern presents a timeline for the intelligence agencies work to handle the alien intrusion. In the 1960s ”something changed the nature of how and why aliens interact with us. It was nothing positive. It was all negative. For us at least”. The only option to the governments was to watch closely what was going on, keeping abductees under constant surveillance. Hence the use of black helicopters and quick-reaction teams. With the increase in reports of implants intelligence agencies took another step forward in the fight against the abduction phenomenon. This was the dawning of MILABS, the military´s own abductions to get the answers to what was really going on. Now abductees didn´t just have to worry about being kidnapped by aliens, they also had to deal with the military abducting them. Field investigating ufologists today are faced with an increasingly complicated enigma. Trying to find out who is doing what to whom – and why? It is like opening Chinese boxes. You open one and find another box inside – with a still deeper mystery. ”I don´t know what has happened , George, but all the mediums have suddenly disposed of their Indian guides, etc., and have replaced them with space people traveling in Vimanas.” This is a very intersting comment made by British ufologist and esotericist Desmond Leslie in a letter to George Adamski, soon after Flying Saucers Have Landed was published in 1954. Adamski was critical of the many mediums (channelers) who in the 1950s proclaimed to be in contact with various space people. Although he was not generally adverse to the idea of telepathic or psychic communication he did give this advice to his co-workers: ”You can never check on the sender of a trance message. Every mock spirit or evil impersonator could come and tell you that his name was Ashtar or Aetherius and that he lived in a space ship. I think that these entities are having a heyday leading astray the gullible mediums and their public… This is not to belittle mediums in any way, but it is to say that most of them have much to learn before they can be sure of just what they are receiving, and from whom and where.” (Lou Zinsstag & Timothy Good, George Adamski - The Untold Story, pp. 55, 57). 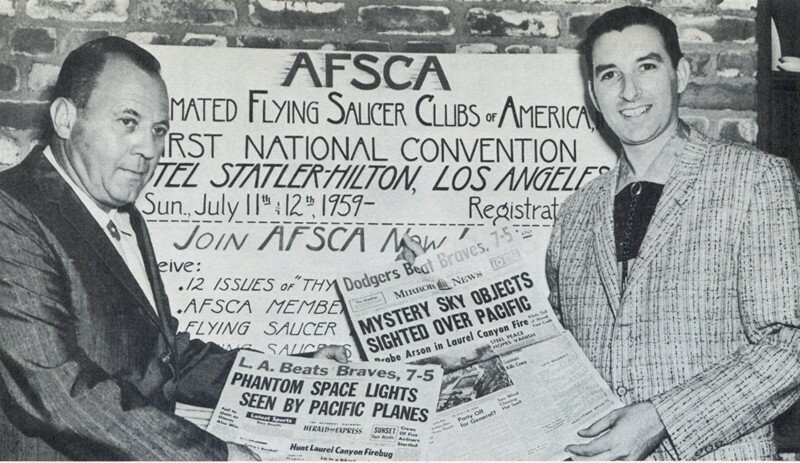 The UFO contactee movement of the 1950s was a colorful spectrum of fascinating individuals. Besides the classic physical UFO contactees there emerged a wide assortment of mediums, often with a background in various spiritualist and metaphysical groups. There were no clearcut demarcation lines between physical and psychic contactees. Some belonged to both camps. GeorgeVan Tassel is a good example, starting as a channeler and later having physical contacts with space people. 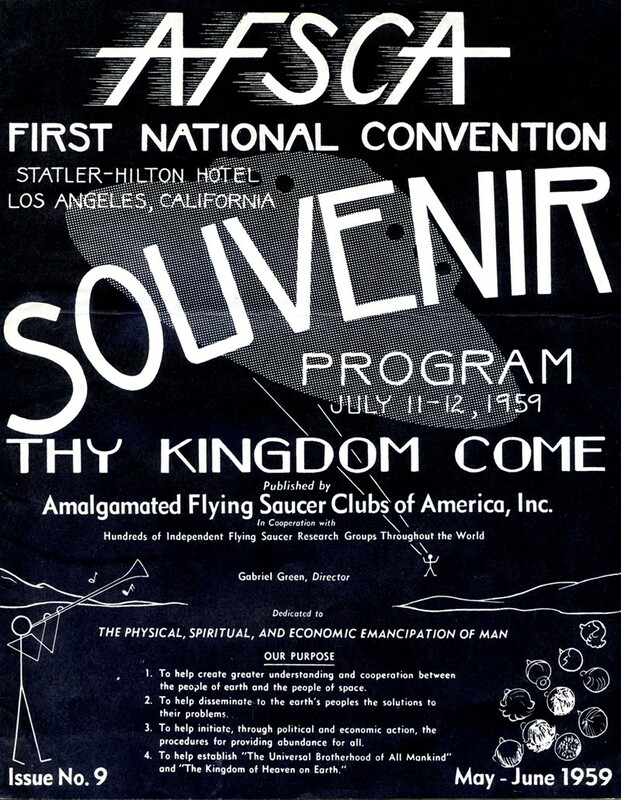 By the end of the 1950s the contactee movement reached its high tide when Gabriel Green, President of AFSCA (Amalgamated Flying Saucer Clubs of America) arranged the First National Convention on July 11 and 12th, 1959 at Statler-Hilton Hotel, Los Angeles. This two-day convention amply demonstrated the problems of the contactee movement. 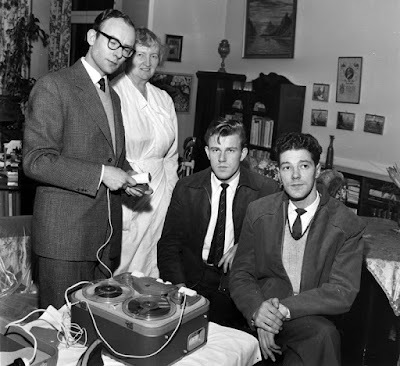 Only two of the classic (and in my view genuine) contactees were present – Orfeo Angelucci and Daniel Fry. Almost all the other 40 speakers were channelers with more or less far-out and bizarre claims and messages. The movement was now so contaminated by psychic racketeers and sincere, but self-deluded mystics that by the end of the 1960s it faded into obscurity. ”LeRoy Roberts, channel from Oregon, one of whose mentors came through and stated the the Master Jesus, before coming to Earth, had visited Mars and had taught its inhabitants to conserve their dwindling water supply – by building canals. Wilbur Miller, who received a transmission from the being Mentar, giving unbelieving Eartlings a well deserved kick in the pants. Prince Neosom (Lee Childers), who claimed to have come from the planet Tythan. When adressing the controversial issue of the possible validity of channeling messages it is interesting to compare the ideas and experiences of Meade Layne who discovered and for many years worked with the unique deep trance medium Mark Probert. 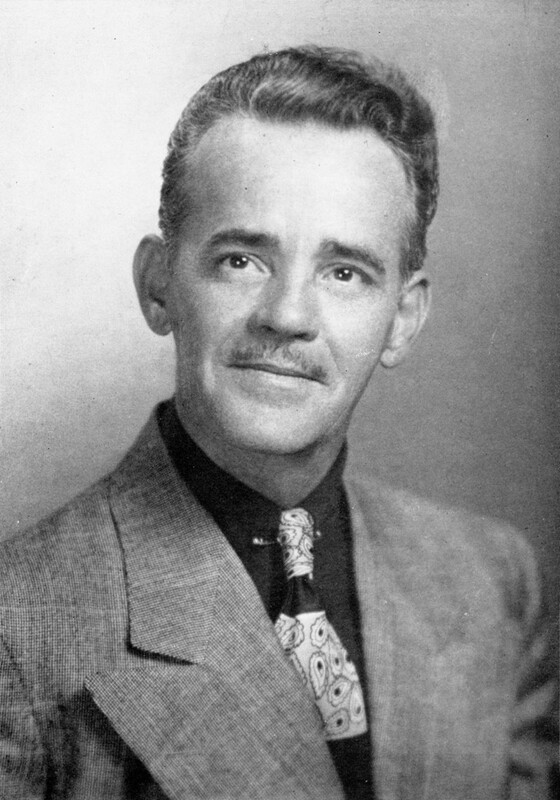 Meade Layne discovered Probert´s unusual gifts as medium in 1946 and it was through him that the etheric or 4-D interpretation of ”flying saucers” was first formulated. 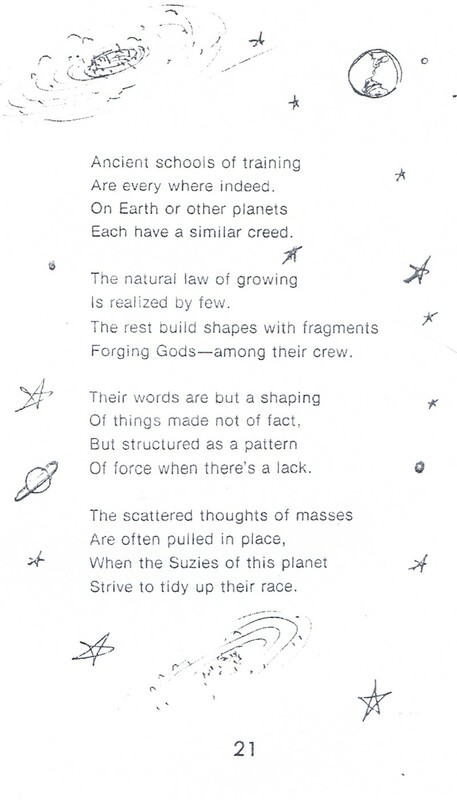 But Mark Probert never channeled any ”space people” as so many of the other mediums. Instead the communicators presented themselves as ordinary individuals who had lived on earth before. Meade Layne was well acquinted with all types of paranormal phenomena and had already in 1936 published an article, Experiments in Evoking Images, published in The Journal of the American Society for Psychical Research (vol 30, no 9). After three years of work together with Mark Probert he published the booklet Mediums and Mediumship in 1949. Regarding the question of spirit identity he concluded: ”Much importance is attached, in some quarters, to establishing the alleged identity of spirit communicators. The question seems of little importance to the present writer, except when spiritism is considered only in its consolatory and religious aspects. The basic question is whether any intelligent and excaranate operator is present; and beyond this, the importance of the communication lies in its content, whether it is intellectually and morally profitable, and whether it conveys any information not easily aviable by normal means.” (p. 14). 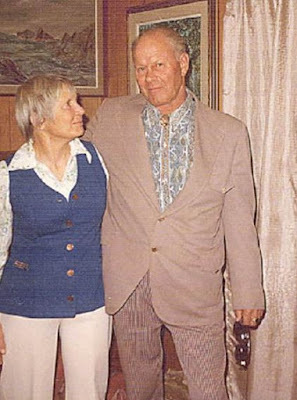 Like Meade Layne I personally, during more than a decade, had the privilege to investigate and become good friends with the Swedish contactee couple Sture and Turid Johansson. In the Autumn of 1976 Sture became a deep trance channeler. The first individual to come through was named Simeno later to be replaced by Ambres, who claimed that his latest incarnation was as an Egyptian merchant, Rameno Charafez, living around 1,000 years B.C. The teachings of Ambres became very popular and soon a group formed around the couple. In the 1980s Sture och Turid moved to the north of Värmland, building a center attracting many followers who came from all over the world to listen to the Ambres teachings. 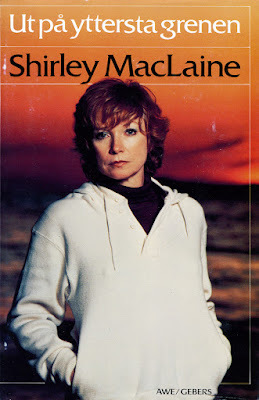 Sture became very famous in the 1980s when celebreties like Shirley MacLaine and Dennis Weaver visited the center in Sweden. 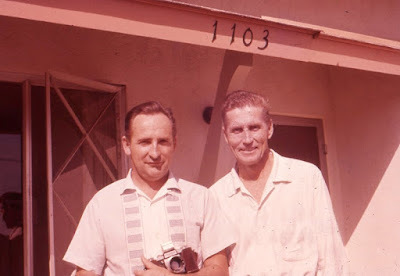 Sture and Turid travelled around the world and I have letters and postcards posted from California, Hawaii and Mexico. Sture also figures in the miniseries Out On a Limb from 1987, based on the bestselling book by Shirley Maclaine. In 1976-1977 I participated in several trance sessions at the home of Sture och Turid and hade many long conversations with Ambres. I taped these sessions and they became important as they taught me a lot of how trance communication works and the problem of interpretation. During the seven or eight seances in 1976-1977 when I participated there was no really new or unknown facts regarding UFOs or paranormal phenomena presented by Simeno. It was essentially a summary of the views discussed in the meditation group we belonged to, although expressed in a somewhat novel form. I do not state this fact to belittle the Sture Johansson channelings. The teachings of Simeno and Ambres are in many respects inspiring and beautiful, a combination of Theosophy, spiritualism and Advaita mysticism. There is no fanaticism, life-negating ascetiscism or political extremism in the messages. ” And, you have heard of and read about a good many Seers, in the past and present centuries, such as Swedenborg, Boehme, and others. Not one among the number but thoroughly honest, sincere, and as intelligent, as well educated; aye, even learned… Tell me, my friend, do you know of two that agree? And why, since truth is one, and that putting entirely the question of discrepancies in details aside — we do not find them agreeing even upon the most vital problems..." (The Mahatma Letters to A.P .Sinnett, Letter 48). ”Unless regularly initiated and trained — concerning the spiritual insight of things and the supposed revelations made unto man in all ages from Socrates down to Swedenborg and "Fern" — no self-tutored seer or clairaudient ever saw or heard quite correctly." (The Mahatma Letters to A.P. Sinnett, Letter 40). ”1. Messages emanating from the relatively nice, well-trained subconscious nature of the recipient. These well up from the subconscious but are regarded by the recipient as coming from an outside source…These messages are normally innocuous, sometimes beautiful, because they are a mixture of what the recipients have read and gathered from the mystical writing or have heard from Christian sources and the Bible. It is really the content of their right thinking along spiritual lines and can do no one any harm, but is of no true importance whatsoever. It accounts, however, for eighty-five percent (85%) of the so-called telepathic or inspired writings so prevalent at this time. 2. Impressions from the soul, which are translated into concepts and written down by the personality; the recipient is deeply impressed by the relatively high vibration which accompanies them… This accounts for eight percent (8%) of the writings and communications put before the general public by aspirants today. 3. Teachings given by a senior or more advanced disciple on the inner planes to a disciple under training or who has just been admitted into an Ashram. These teachings bear the impress and conclusions of the senior disciple and are frequently of value; they may—and often do—contain information of which the recipient is totally unaware. The criterion here is that nothing (literally nothing) will concern the recipient, either spiritually or mentally or in any other way connected with his personality, nor will they contain the platitudes of the religious background of the recipient. They will account for five percent (5%) of the teaching given, but this is in relation to the entire world and the percentage does not refer to some one occult group, one religious faith or one nation. The recognition of this is of vital importance. None of these esoteric authors mention the possibility of communicating with extraterrestrial visitors. In this area we find another problem not addressed: psychic communication with the help of technological instruments as mentioned by George Van Tassel and Daniel Fry. But whatever the form of communiction, the problem of identification is just as relevant when it comes to physical contacts. How do we know the visitors are what they claim to be? My favourite heretic among ufologists, John Keel put it this way: ”Suppose a strange metallic disk covered with flashing colored lights settled in your backyard and a tall man in a one-piece silver space suit got out. Suppose he looked unlike any man you had ever seen before, and when you asked him where he was from, he replied, "I am from Venus. " Would you argue with him?” (Operation Trojan Horse, p. 214). Today there are not many ufologists left of the first pioneers from the 1950s. Recently the AFU board members were informed that one of Sweden´s real oldboys in our movement, Sven Schalin died on October 13, 2017. It is unfortunate the this sad message didn´t reach us until now as we stilll don´t know if Schalin´s UFO archive has been saved. Many years ago we were allowed to copy some of his material but as for all the original reports, photos, correspondence etc. we fear it has ended up in the local dump. The tragic fate of many rare and unique ufo archives. Perhaps even more frustrating was the information that Sven Schalin in his will donated around four million SEK to the Swedish Anthroposophical movement. Schalin had for many years been an AFU supporter and we had of course hoped he would remember AFU in his will. With four million SEK we could have realized our old dream of having one large archive facility instead of the present 14 premises, scattered in different buildings. But we have been around since 1973 so we just keep on hoping that someone on this little planet find our work and efforts worthy of a major donation or remember us in his or her will. Sven Schalin was born i Gothenburg 1925. He studied aerospace engineering at Chalmers University of Technology, Gothenburg and in 1954 moved to Linköping, working for SAAB, the Swedish aerospace and defense company, founded in 1937. During his engineering career at SAAB, Schalin worked in developing famous Swedish fighter aircraft Saab J 35 Draken, Saab 37 Viggen and Saab JAS 39 Gripen. He retired in 1990. 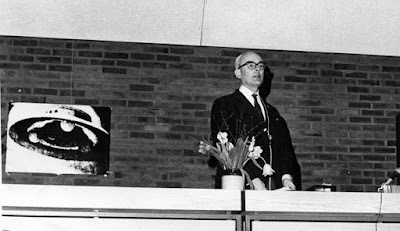 Sven Schalin lecturing at the UFO-Sweden annual conference, Jönköping 1974. It was during his work at SAAB that Schalin first heard of flying saucers. In 1956 a colleague at SAAB asked if he had read Flying Saucers From Outer Space by Donald Keyhoe. Schalin read the book and became deeply fascinated by the subject. Even more so when a man from British Intelligence visited SAAB and related further information. 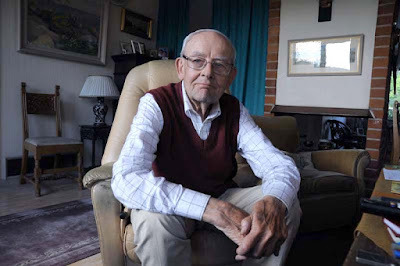 This man later sent a list of UFO literature to Schalin who read all he could find on the subject and also became a member of NICAP (National Investigations Committee on Aerial Phenomena), headed by Donald Keyhoe. The first major UFO case investigated by Schalin was the Domsten close encounter. On the evening of December 19, 1958, two young men, Stig Rydberg and Hans Gustafsson claimed to have encountered a landed saucer outside Domsten in southern Sweden. They were attacked by three or four formless creatures who try to drag them into the saucer. After a fierce fight the boys escaped, the creatures entered the craft and it took off. This sensational story was printed in several newspapers and was even investigated by the Swedish police and military. Sven Schalin interviewed the boys assisted by Dr. Ingeborg Kjellin (MD) but although skeptical they found no natural explanation. But in 1989 my AFU colleagues Anders Liljegren and Clas Svahn disclosed, after years of in-depth research and detective work, that the case was a simple hoax inspired by the Tom Trick science fiction series published in a Swedish magazine. Much because of articles in the magazine Se, 1959 and Såningsmannen 1960, Sven Schalin became a well known figure in Swedish ufology, resulting in public lectures and many contacts with UFO witnesses. In 1959 he also began working together with Edith Nicolaisen, founder of the Parthenon publishing house and for a few years was also a board member of Parthenon. Nicolaisen published several of the classic contactee books on the 1950s and 60s. She was a demanding and hard working woman, not easy to get along with as she expected co-workers to be totally devoted to the Parthenon spiritual mission. This, coupled with different opinions on the UFO problem, made Schalin leave the Parthenon board in 1963. Part of article in Såningsmannen no 4, 1960. The influence of Anthroposophy on the UFO movement has been quite extensive but so far very little documented. A list of ufologists more or less influenced by Rudolf Steiner would include Allen Hynek, Gordon Creighton, Trevor James Constable, Gordon Allen, Dan and Eileen Lloyd. Personally I find it rather surprising that so many leading ufologists have been inspired by the rather odd mixture of Christian mysticism and esotericism advocated by Rudolf Steiner. The Ahriman-Lucifer demonology of Anthroposophy is reminiscent of ideas presented by fundamental Christian groups where UFOs are usually interpreted as demonic. 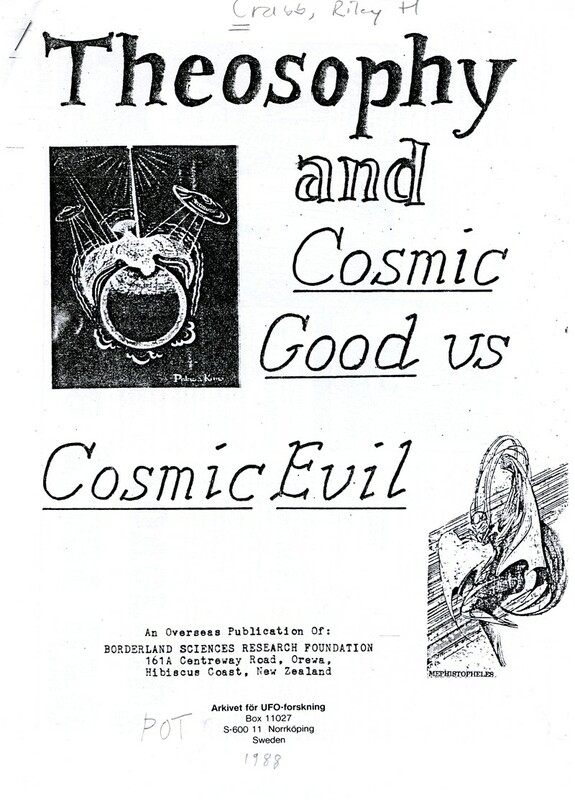 If these ufologists had instead followed the more balanced approach, interpreting UFOs from the core Esoteric Tradition (Blavatsky, Bailey, Laurency) as exemplified by Desmond Leslie, Meade Layne and Riley Crabb the result would have been different. Sven Schalin did not personally investigate many UFO incidents but one case he found of great interest was the Kolmården close encounter August 23, 1967. In the small community Kolmården, close to Norrköping, two teenagers observed strange lights and a small, skinny figure carrying some sort of instrument. Schalin never revealed the identity of the witnesses but some time ago investigators from UFO-Sweden found and interviewed the woman involved, who confirmed the incident. Håkan Blomqvist (HB): How would you summarize your view of the UFO problem today? Sven Schalin (SS): In the beginning I believed it was space ships. Further on I became more suspicious when reports of objects formed and dissolved appeared. There were many such cases and then I realized this was something different. HB: But you didn´t interpret these cases as manipulations of a higher technology? SS: I became convinced there is a spiritual world and from this world entities can manifest. I began to suspect they are deceiving us. I believe there are both negative and positive forces involved in all this. Today I favor the theory of materialisations. HB: Why did you end your active involvement in ufology? SS: When you realize that there are very treacherous things involved you want to study the spiritual aspect more. 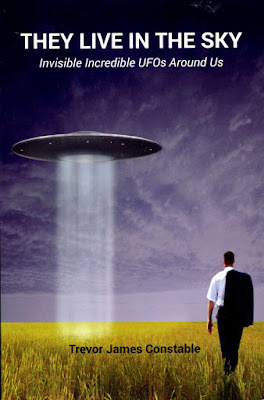 I didn´t want to dig deeper into ufology but chose to study Anthroposophy instead. But I am very confused about all this talk of crashed saucers. Where do they come from? HB: Anthroposophists generally have a very negative view of UFOs? SS: I had expected to get some answers to the UFO enigma through Anthroposophy but I didn´t. There is a man called Hans Mändl, a leading anthroposophist. He meditated on this enigma and I received a very brief answer. He implied that this were some form of cosmic jokers. That is all the information I got this way. Anthroposophists are reluctant to have anything to do with UFOs. 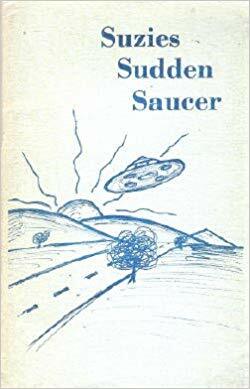 Sven Schalin wrote very few UFO-articles during his active years. 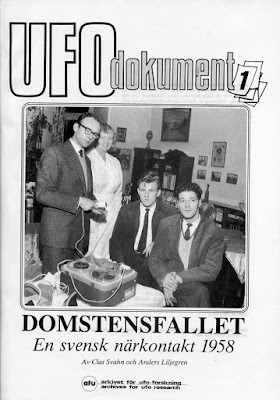 He did present a summary of his views in the magazine UFO-Information no 8, 1971, Ännu gäckar de oss (They still elude us). Schalin advocated continued serious research also involving the non-material aspects. I admire his courage to publicly stand up for UFO reality in 1959, especially with regard to his position as engineer at SAAB. 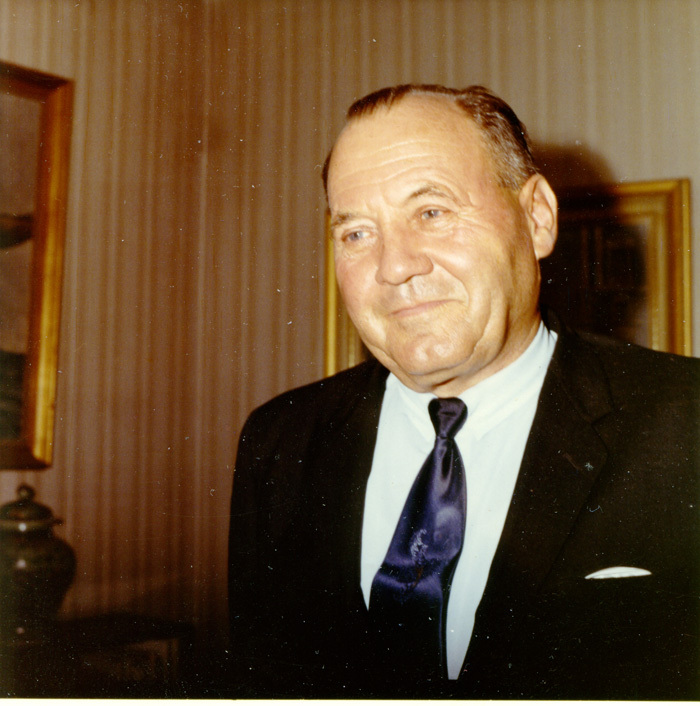 He was once ordered to come to the then technical director at SAAB, Hans Brising. Schalin feared a reprimand because of his UFO interest but instead Brising told of his serious interest in the subject but didn´t want this information to be made public. Sven Schalin was a brave pioneer in the Swedish UFO movement.